an interdisciplinary research team at the University of Chicago working at the interface of economics and archaeology. Our work combines satellite images, archaeological records, and market data to impute information about trafficked artifacts from the Middle East. Their aim is to "estimate the hypothetical value of archaeological material to insurgent groups in Iraq and Syria". I am really puzzled by this fixation with "the numbers". What is the matter with these people? Is there a difference between this or that group making 25 thousand green ones a month or 250 if they put that money to no good? As far as I am concerned (and I am sure I am not alone in this) the question of "how much?" is an entirely secondary one. How about starting with the question "whether"? It gets worse. As described, their research methodology sounds pretty wonky. First, the archaeological data includes (sic) detailed observations of objects excavated at a representative sample of sites spanning the Early Bronze Age to the Islamic Period. In tandem, we gather data from observable market activity, separating categories of artifacts collected from auction catalogues and public gallery data. Combining these data sets, we match excavated objects with the same object categories sold on the market. 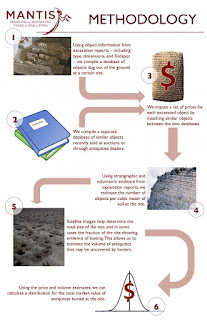 Using a statistical technique called imputation, we then generate a range of reasonable prices for objects that may have come directly from the ground. With this range, we estimate unexcavated objects' potential value on the visible market. The graphic [...] provides a conceptual overview of our empirical method. The black market trade in antiquities is opaque and poorly understood. The prices paid directly to looters are difficult to measure. As a result, our team uses the most recent evidence to estimate the fraction of market price that may be paid to the source. Wow. Here is a clear example of the intellectual effects of too much American TV. I think we should know who refereed this project design. It takes so many things as given and ignores a whole load of methodological unknowables. This is appalling, and worse than any "figures snatched from thin air' because it "looks like science". What on earth is going on? Taking a "sample of sites" is meaningless, the holes dug across Dura Europos (for example) will have hit areas with different densities and types of finds as such an area represents a multiplicity of activities over an extended period of time in the past, each of which activity may well have been 'zoned', and also there will be extensive levelling deposits. Not to mention the fact that different types of activities within the zones (trampling for example) will lead to varying degree of artefact fragmentation - which directly affects 'collectability' (so saleability). So you cannot simply say x metres cubed of soil equals y saleable artefacts of a certain type. That's just bonkers. Archaeologists and collectors see different things in artefact assemblages and artefacts. An archaeologist will be interested in the bulk evidence of coins to answer questions on their use in a particular context, their condition (wear, degree of corrosion etc) is not important for this, a dealer on the other hand is interested above all in condition and rarity of a particular issue (collectability). You cannot measure this by comparison with an archaeological report. Archaeologists attempt to get the maximum information out of the ground per unit cost, this usually means maximum retrieval strategies, artefact hunters are not interested in maximum information value but resale value, so will concentrate on getting certain types of artefacts out, but only to the limit at which it is cost-effective. So if the site is rich in 'low-retail-value' artefacts of a certain type, then only the more collectable (saleable) pieces will be retrieved when retrieving the less attractive pieces involves costs greater than the resale value at that end of the market. Many factors are involved in determining when that point is reached. But again, this is not something that one can get at from archaeological reports. There are many photos of looted sites on the internet showing just how much broken material is left behind, the artefact hunters only cherry-pick, but what they pick up and what they leave is often a very subjective process, dependent on the knowledge and contacts of the artefact hunter. There is no mention of how these people intend factoring this into their calculations. Obviously remotely judging from a Chicago library what "could have been taken" is pretty useless as a means of research compared top actually going and looking at the evidence on the ground (like excavating looters' spoilheaps) for what was in reality left behind on various sites. Their methodology implies that the artefacts on what they call (mislabel) the open market - for there is nothing really open about it - will be the same types as are currently being looted. Yet every dealer on this planet will swear blind that while they have no paperwork for it, all of the material they sell is "from old collections". In other words, that material will have been through two filters, what was collected by artefact hunters in those far off "old days" and what collectors collected in those "old days". But fashions change in collecting, as do techniques (the availability of metal detectors has caused fundamental changes in the market as a whole in the last forty-odd years). Or perhaps they will postulate that all dealers lie (they will be the ones saying it, not me) and that most of the MENA material on that "open legitimate market" is actually in some way identical to the MENA material currently being looted. But both of those models are unprovable assumptions. No amount of statistical jiggery-pokery is going to get around that. Finally, it seems that the team has not really been paying attention to the discussion. First of all, to put a big map of ISIL territory on the website suggests (to the purse-string holders only maybe) who their target is, but a lot of the more egregious cases we currently know about were not (as Sam Hardy, myself and others have shown) done by anyone working for ISIL. Secondly, it is not how much is being paid to the diggers that is the issue. It is how much the sale of the items is reaching in internal sales and above all any smuggling which is (or is not) generating cash for militant activities. I think the presentation of this project is disappointing and would have expected much, much better from one of America's leading universities.